DeVore Nutrition and Wellness, LLC - Professional Nutrition Services in Williamsburg, Va. Happy New Year! Make 2019 your best year yet! Prioritize your health! See my "Services and Packages" page to see what might suit your needs best. I have lots of new ideas to help my clients be the best version of themselves! Welcome to DeVore Nutrition and Wellness (DNW) an independent nutrition consulting practice in Williamsburg, owned and operated by Registered Dietitian, Amber DeVore. DNW provides clients with sustainable, realistic, and measurable nutrition, wellness, and health goals. DNW's clients are all different, each with unique nutrition needs and circumstances. Amber provides personal attention and works with you to identify a clear and achievable path to your goals. A wonderfully illustrated book for children and families dealing with food allergies. 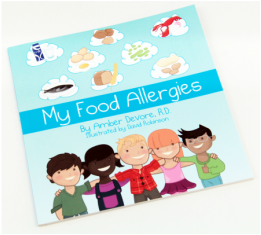 DeVore Nutritoin and Wellness's owner, Amber DeVore, is also the author of "My Food Allergies." Written by Amber DeVore, a Registered Dietitian and mother of a child with a life threatening food allergy, the book is designed to encouraged thoughtful discussion between you and your child about their specific allergy and how to stay safe and prevent reactions. My Food Allergies is NOW available for purchase in paperback! Also currently available for Kindle.